I don't know about you, but fall for me means packing stuff. Packing lunches for school, packing kids into the car, trying to fit two lunchboxes into my handbag. And a book for the kid, and one for me. And three water bottles. All the sudden there is all this stuff which is only needed part of the time... Sweaters we need in the morning that just end up in bags by noon. Umbrellas we need for showers that clear up suddenly, and now we need our sunglasses out, and the sunblock for another week or two. At least in Michigan, the weather can never make up its mind. So, I'm cruising the large bag patterns to find one that works for my family of four, or just for me when I'm in the midst of a long book, with an umbrella, water bottle, notebook, sketchbook, lunchbox, and spare sweater in tow. 1. The classic large bag may be a bit large for everyday use, but is, I'm sure, on every sewist's bucket list: Amy Bulter's Weekender Travel Bag. I always see one or two of these at sew ins being pressed into service as quilt carriers. 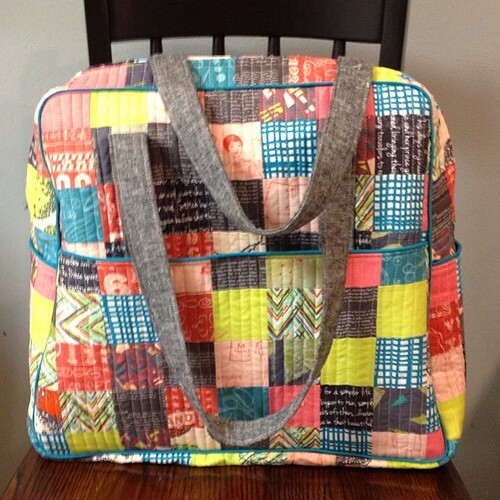 While I'm sure we all have seen ones we drool over, but my favorite is this one by Elizabeth, that she made with a Blogger Bundle from Pink Castle Fabrics created by Katy Jones. 2. Another travel bag is the StudioCherie duffel. I have not seen one in the wild, but rumor has it that it's huge! It certainly is cute in these penguins! 3. Noodlehead's Super Tote is an excellent around-town bag. Here is a pretty one in this fun Echino print. I love the lining, too, just the right touch of lemongrass. I just bought this pattern myself! 4. 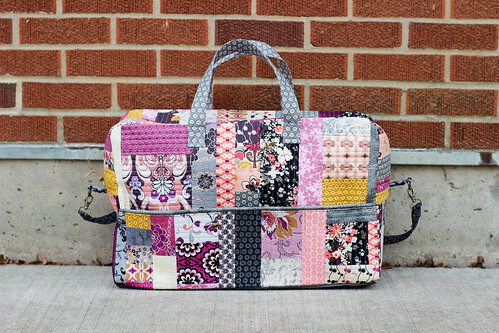 A fairly recent pattern that looks nice and roomy (and ready for travel) is Bari J's Holiday in London Duffle Bag. Fabric designer Jeni Baker of In Color Order made one in a quilt as you go fashion, blogged here. These are my colors, Jeni! 5. Sidekick Mini Suitcase. I know this is one for the kidlets, but I seriously want one of these for myself! It reminds me of those glamorous train cases. I can just see hauling my fat quarters around in one of these! Here is a particularly adorable one made by Barb from the Crafty PhD. 6. 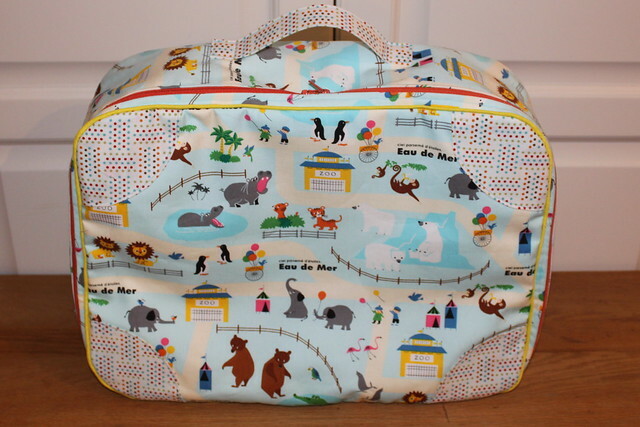 A newer addition to the traveling bag pantheon is Sew Sweetness's Aeroplane Bag. It's large enough to fit a (small) sewing machine! There are many adorable examples but since I had to pick just one it would of course be one with pink and purple patchwork! 7. 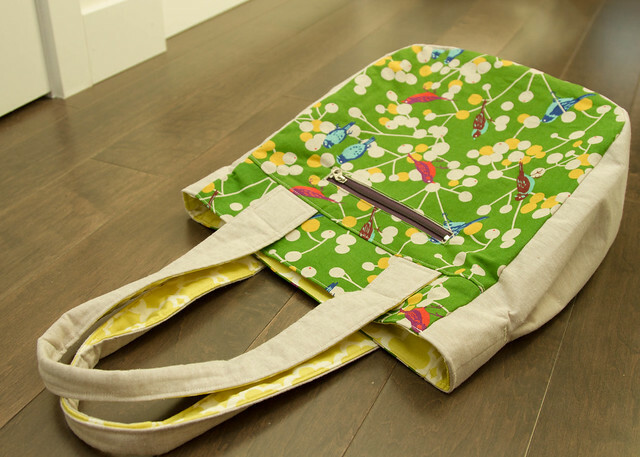 Another versatile bag is Anna Marie Horner's Art Student Tote. The contrast straps make this a bold statement bag, while the many pockets make it so your small items don't get lost. The pattern includes instructions for three sizes. I have chosen a bag from Sarah of Sew What, Sherlock? to feature, because I love her use of a text print to highlight the straps. It's a daring choice that really pays off. Doesn't the pink text print just make the bag! It's so hard to chose a favorite pattern! Obviously, I just need many, many bags! But which one first? 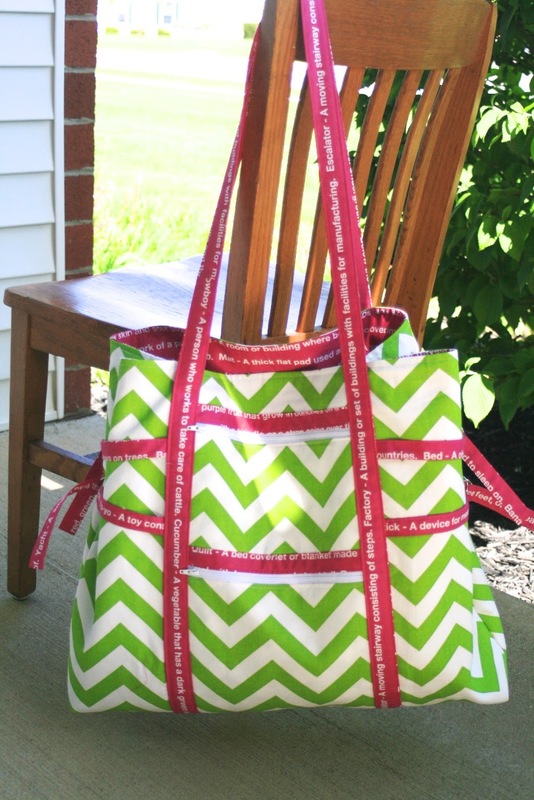 What's your favorite large bag pattern? Which ones did I miss? 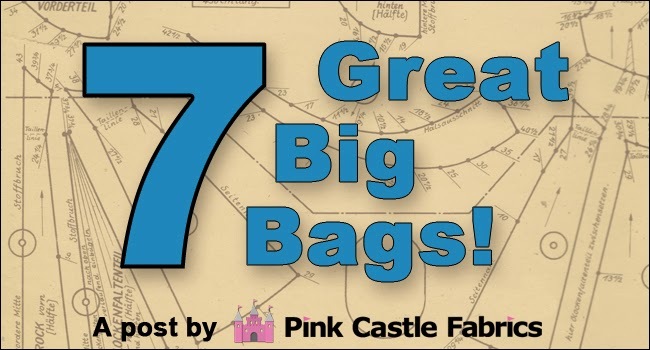 Be sure to share your new (or old) bags in our Made with Pink Castle Fabrics Flickr group! You can see my new bag there, too.